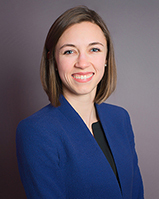 As development officer, Kaitlyn coordinates Foundation events and assists with all aspects of donor engagement as well as the Foundation's marketing and communications efforts. Kait joined the Foundation in March 2018. Prior to joining the Foundation, Kait worked at Interfaith Youth Core in Chicago as its foundation relations manager. There she collaborated with senior staff to prepare compelling reports and proposals for funding partners and stewarded a grants portfolio of national and family foundations through which she secured more than $7MM in revenue during her tenure. Kait graduated from St. Norbert College with a bachelor's degree in Religious Studies. Kait is a lifelong resident of DuPage County, grew up in Glen Ellyn and lives in Winfield with her husband. She is a volunteer for Bridge Communities (www.bridgecommunities.org) and a member of her alma mater's Alumni Advisory Board.